Students at The Sixth Form College, Solihull got a crash course in developing communication skills this week, thanks to a visit from The Phoenix Group. A level English students were among a group of more than 50 students who attended the interactive presentation by four staff from The Phoenix Group’s Wythall office. They covered issues like how to communicate to engage people, social media for business and using graphic design in promotional campaigns. 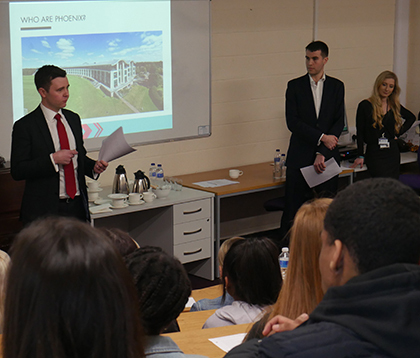 The Phoenix session was part of the English department’s ‘English for Life’ programme, which invites companies and individuals into the College to speak to students about careers opportunities that are particularly relevant to those studying English at A Level. The Phoenix Group’s Corporate Communications Team of Paul Morris, Laura Scott, Jonathan Evans and Jade Stowe were keen to demonstrate how A levels in English Language and English Literature were ideal in an industry which relies on the ability to write and speak professionally. Students were particularly interested in how the company launched its award-winning intranet services using film posters and a pop-up cinema with popcorn. The College offers two A level English courses, with both English Language and English Literature courses on offer. The department also operates a Creative Writing enrichment course, as well as a Shakespeare Academy to stretch those most ambitious of English students who are hoping to continue the subject at university. The Shakespeare Academy allows some of our most able students to complete a piece of private research in the form of an Extended Project Qualification, which can significantly aid a student’s progression opportunities.